I feel slightly sheepish that I haven't shared this will you all before. If your looking for something to do this Thursday, I HIGHLY recommend checking out Gather: Oak Park. And for this year, this is your last chance. 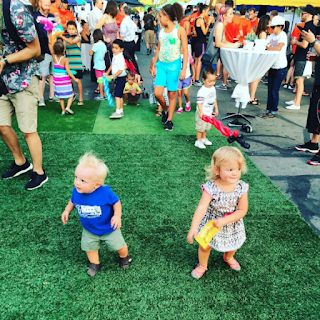 This foodie event features some of the best food trucks around, a communal dining area, great local beers, life music and a kid area - although my kids spend the whole time dancing in front of the DJ. It is well worth checking out. Some other thinks I recommend while you are in the area: stop by Oak Park Brewing for a beer before heading to Gather. Especially if your kids do better eating early and while sitting. If you haven't checked out DISPLAY California yet - its right across the street from Gather and sense both are run by Unseen Heroes - they keep DISPLAY open a bit later on Gather nights. Last month it was a bit too hot for us to stay very long but this week promises cooler weather. Check it out and let me know what you think!